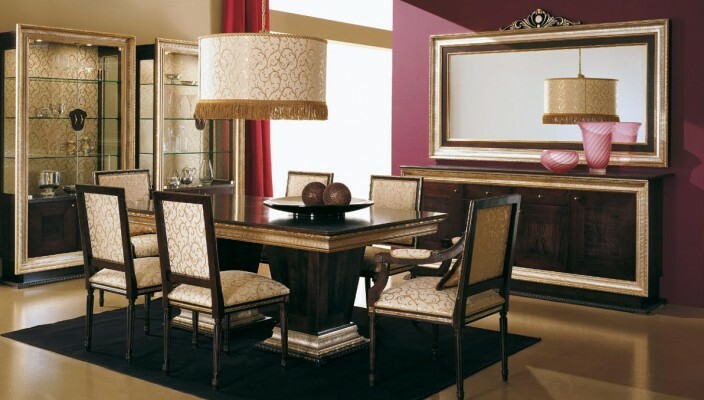 One exciting way of adding drama to dining room of yours is by making use of dark and bold colors on wall. Walls with especially dark shades look attractive when you make use of lights during dining and evening hours. Dark colors on all walls or a single wall of your dining room adds formal touch by creating different decorative effects. Floor mat matching with table top lying down below it gives much bigger outlook of dining table as compared with its original size. Bright red and long curtains hanging from ceiling provides a classy look to room. A large landscape mirror hanging on wall give a sense of more space to room and reflection of glassware and chandelier looks great adding color to atmosphere of room. Glass panels showcasing antique cutlery items provide a more royal look to this golden dining room. One delicate chandelier is hanging from ceiling, whose rich light is not looking out of this place.